The harp is a fascinating and mysterious instrument, whose music, art and craftsmanship have had a lasting bond since ancient times. With this in mind, the Museo dell’Arpa Victor Salvi has created a collection of educational pathways so children and youngsters can approach this wonderful world. A visit to the Museo dell’Arpa and to Salvi Harps offers a journey through the history of this age-old instrument: beginning with antique harps – real treasures of art - we will explore its entire sound universe right up to the techniques and secrets of the most advanced manufacturing. This experience can be combined with our in-house recreational and educational workshops, or a visit to some of the most interesting local places: Castello della Manta, a property protected by FAI Fondo Ambiente Italiano (National Trust of Italy), and La Fabbrica dei Suoni in Venasca. A unique occasion to experience first-hand and in an enjoyable way our artistic excellences. All the proposed activities are led by professionals of the sector with proven experience, and prices include adequate insurance coverage. There is a Museum Shop with gadgets and dedicated accessories inside the Museum. Participants will visit the Museo dell’Arpa Victor Salvi and Salvi Harps of Piasco, the best known around the world for harp manufacturing. They will be able to discover the processing techniques and secrets by following the process from sanding red maple boards to varnishing, watching the MASTER CRAFTSMEN take care of aesthetic detail with meticulous marquetry and then seeing researchers monitoring the sound through accurate testing. It will be possible to witness the birth of a unique instrument, a real WORK OF ART, consisting of approximately 2000 mechanical pieces and 150 wooden parts. The visit continues to the MUSEO DELL’ARPA VICTOR SALVI, where the historical harps of the Collection, desired by Victor and Julia Salvi are exhibited. The technical and expressive evolution of the instrument can be followed through the vision of truly unique pieces made from the beginning of the 18th century to the first half of the 20th century. Participants will be able to listen to the sound of the harp and everyone may try to play this instrument. Upon request, middle schools specializing in music, Music Schools and Conservatories have the opportunity to book special activities with additional costs to be verified according to the requests. Costs: A student ticket, including a guided tour of the Museo dell’Arpa Victor Salvi and the Salvi Harps is reduced to € 3.00, while the disabled, teachers and helpers have free admission. Where: Activities will take place in Piasco. Duration: The visit to the Museum and the Salvi Harps will last approximately two and a half hours. The visit to the Museum and to Salvi Harps is combined with the Make your own harp recreational-educational workshop. 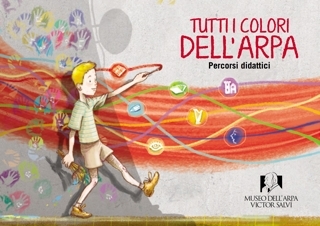 It is the new experience, reserved for schools that visit the Museo dell’Arpa Victor Salvi. The children and youngsters will have the opportunity to transform themselves into "master craftsmen" and MAKE A SMALL HARP. It is a recreational-educational moment in which the youngsters can put their manual skill to the test. The individual pieces of the harp are already premade and joined and they must be shaped. Once the harp is made, it can then be coloured and will become a fun gadget to take home as a keepsake of the visit to the Museo dell’Arpa Victor Salvi. We hope our "little luthiers" will enjoy their work! To ensure maximum protection, no tools or utensils are used: colours are supplied in accordance with the law and will not cause any side effects. Costs: A student ticket, including a guided tour of the Museo dell’Arpa Victor Salvi and the Salvi Harps, plus the workshop demonstration is € 6.00, while the disabled, teachers and helpers have free admission. The visit to the Museum and to Salvi Harps is combined with the Harp in action recreational-educational workshop. Participants in Harp in Action will be able to have a unique experience. An educational workshop in which they can learn the characteristics of sound and watch basic musical knowledge being applied during instrumental practice. They will also be able to discover the great potential and "special effects" of this instrument. Imagination and action will be the essential ingredients to approach and empathise in the sound of the strings and the music of the Harp. Costs: A student ticket, including a guided tour of the Museo dell’Arpa Victor Salvi and the Salvi Harps, plus the Demonstration Workshop is € 9.50, while the disabled, teachers and helpers have free admission. The visit to the Museum and to Salvi Harps is combined with the trip to Castello della Manta, one of the most interesting local historical-artistic places and property of FAI Fondo Ambiente Italiano. On the hills of the province of Cuneo, the Castello della Manta preserves one of the most amazing examples of international Gothic painting in the Salone Baronale (Baronial Hall): a cycle of frescoes depicting "Eroi ed Eroine" (Heroes and Heroines), which is matched on the opposite wall by the "Fontana della Giovinezza" (Fountain of Youth). The castle complex is the result of successive aggregations beginning from the original XIII century fortress and then enriched in the sixteenth century with the elegant Salone delle Grottesche (Hall of Grotesques) and a beautiful frescoed gallery. The nearby parish church contains wonderful fifteenth century frescoes. Costs: A student ticket, including a guided tour of the Museo dell’Arpa Victor Salvi and the Salvi Harps, is reduced to € 3.00, while the disabled, teachers and helpers have free admission – groups of 25 (approximately). Castello della Manta (entrance ticket + educational offer). Entrance ticket: € 3.00 per student (classes are not FAI members) or € 2.00 (classes are FAI members). The disabled, teachers and helpers have free admission – groups of 25 (approximately). Educational offer: € 3.00 per student for the guided tour or € 5.00 per student for the visit. Payments are made at the ticket offices in each facility. Where: Activities will take place in Piasco and Manta. Duration: The visit to the Museum and the Salvi Harps will last approximately two and a half hours, while the guided trip to the castle is 75 minutes and the visit is two and a half hours. Lunch: Possibility to have lunch in the affiliated restaurants in the area (Manta). The visit to the Museum and to Salvi Harps is combined with the trip to La Fabbrica dei Suoni to continue the day dedicated to music and sound. La Fabbrica dei Suoni is the first Italian thematic park dedicated entirely to sound and music. Participants will find themselves immersed in a captivating and unique tour that will make them understand the genesis of SOUNDS and NOISES, learn the parameters of speed, pitch, intensity and timbre, experiment the VIBRATION of sounds and the sound wave propagation in space. A three-dimensional cartoon will be screened at the beginning of the tour, showing Professor Macro and his student Micro contending with sounds and noises. They will be able to enter, for example, inside giant musical instruments or sit on swings to listen to the SOUNDS OF NATURE or, even see their VOICE wave displayed and get onto a musical scale. Costs: A student ticket, including a guided tour of the Museo dell’Arpa Victor Salvi and the Salvi Harps and La Fabbrica dei Suoni is € 13.00, while teachers and helpers have free admission. Payments are made for the visit of the two facilities at the ticket office of La Fabbrica dei Suoni. Where: Activities will be held in Piasco and Venasca. Duration: The visit to the Museum and the Salvi Harps will last approximately two and a half hours, while the visit to La Fabbrica dei Suoni will be around two hours. Lunch: La Fabbrica dei Suoni will provide a heated covered area for participants.